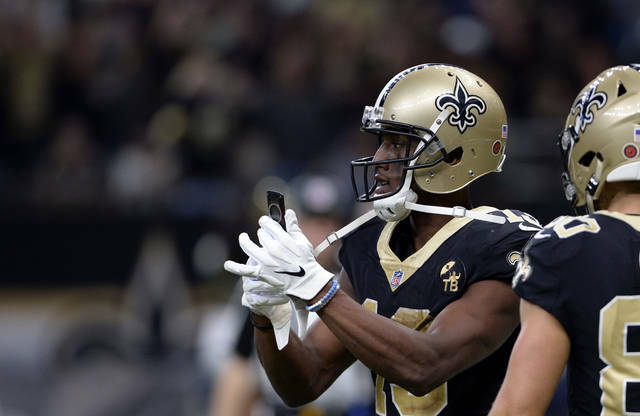 No real reason for everyone to flip out at what New Orleans wideout Michael Thomas did with a flip phone. He was just having a bit of fun, paying homage to former Saints receiver Joe Horne’s own cell-ebration 15 years ago. 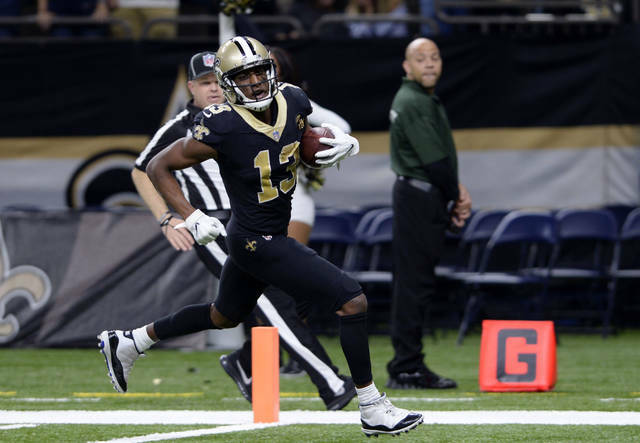 Just as Horne did, way back when, Thomas pulled a phone out from the padding of the goal post after scoring a TD, this one an outcome-sealing 72-yarder that made Los Angeles cornerback Marcus Peters look pretty bad in the fourth quarter of the Saints’ rollicking 45-35 victory over the previously unbeaten Rams. “Giving people a show,” Thomas said. He was referring to his tribute to Horne, but he could have been talking about his entire performance Sunday — 12 catches for a franchise-record and NFL-season-high 211 yards — or the game as a whole. What a game it was, marking the Saints (7-1) as serious contenders and exposing the Rams (8-1) as defensively flawed, all the while offering entertainment by the minute. This season’s elite teams have established themselves. These two in the NFC are joined by the AFC troika of the Kansas City Chiefs (8-1) and sudden superstar Patrick Mahomes, the New England Patriots (7-2) and the Los Angeles Chargers (6-2). Worth mentioning: KC’s only loss came against the Patriots; the Chargers’ two setbacks came against the conference-leading Chiefs and Rams. Let’s get back to the moment that got everyone talking. Prescient as can be, Thomas said he’d prepared one old-fashioned phone of the sort Horne used in each end zone. Kind of cocky? Sure. But also justifiable, considering that Thomas is now up to 70 catches for 880 yards and five scores, quickly establishing his pairing with Drew Brees among the most dangerous QB-WR tandems in the league. Of course, Thomas drew a flag assessed on the ensuing kickoff. “This is too big of a game to be risking those kinds of yards,” intoned announcer Troy Aikman on the Fox broadcast. Even Deion Sanders, of all people, said on the NFL Network he thought Thomas made a mistake. That’s because while the rules allow — as they should — the sort of choreography the Seattle Seahawks come up with week after week, what Thomas did is penalized because he used a prop. Now THAT’S a terrible call. Count on Bill Belichick to dream up something to remind everyone that he’s as creative a coach as there is. The pregame focus was entirely on Tom Brady and Aaron Rodgers — and which QB is really the greatest of all time — before New England’s 31-17 victory over Green Bay. So, naturally, missing Rob Gronkowski and Sony Michel to injuries, Belichick figured out ways for somebody other than TB12 to shine. 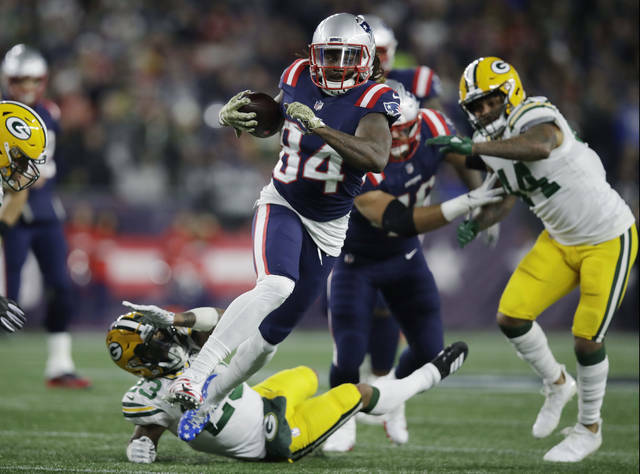 Kick returner Cordarelle Patterson is suddenly a running back, gaining 61 yards on 11 carries with a TD, and the go-ahead touchdown was set up by a 37-yard completion — thrown not by Brady, but by receiver Julian Edelman . Well, um, no. Not very well. Not lately, anyway. Caleb Sturgis of the Chargers had a pair of errant extra points and also flubbed a 42-yard field-goal try, but none of that mattered, because LA defeated the Seattle Seahawks 25-17. Sturgis has blown a PAT and a FG in three consecutive games, a trio of trip-ups no NFL kicker had managed to pull off since Jim Breech of the Raiders in 1979. Overall this season, Sturgis has missed 10 kicks — yes, 10! — and is 9 for 15 on extra points and 9 for 13 on field-goal attempts.